This lasagna is a real crowd pleaser: creamy without being oily with a good punch of squashiness. It lacks the often painfully long lasagna prep and is very easy to throw together. I’ve gotten a lot of compliments on this pan o’ noodles, and we all know how much I love to be flattered. *Kabocha squash is commonly used in Asian cooking; you often see it in tempura and think it’s sweet potato. It has a very distinctive green rind and is often referred to as pumpkin on the menus. Heat your oven to 400 degrees and bake the squash, cut in half with cut side up, until a fork goes through easily. Dice the shallots and leek, making sure to rinse the leek thoroughly! Saute over medium-high heat with the olive oil until soft. Meanwhile, warm the milk over low heat, stirring occasionally. There’s nothing quite like a pan of burnt, disgusting milk, so make sure you remember to give it a shimmy and a shake every now and then. Otherwise, you’ll be making all the mama cows out there cry! (mmm fat) with salt, pepper, and a pinch of nutmeg. When the butter has melted, add the flour and mix until incorporated. Cook for a minute or two. When the roux is nice and thick, slowly add one cup of the warm milk. And stir until smooth. It’s important not to add all of the milk at once; if you do, it will be a lot harder to have a smooth mixture and your hand will get tired from whisking so much. Slowly add the rest of the milk and cook until thickened, stirring constantly. And you’re ready to assemble! BOOM! 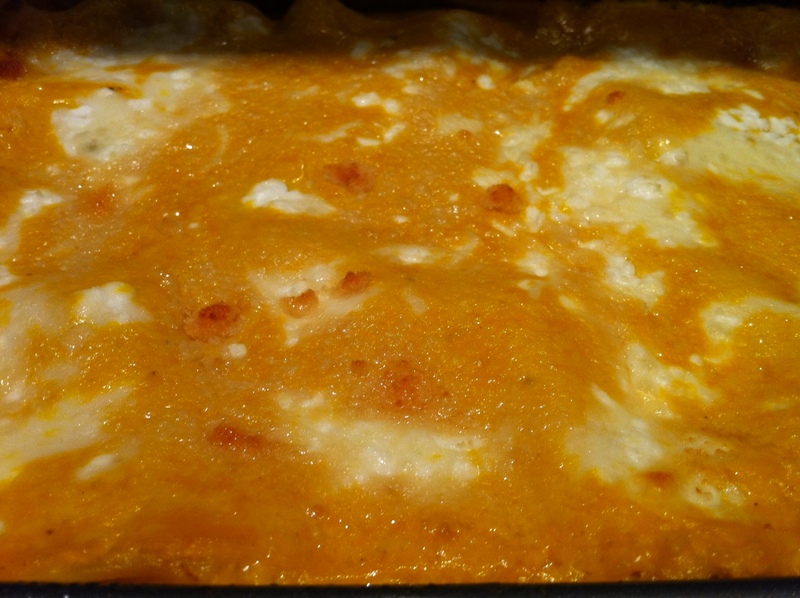 The top of the lasagna should be parm and cheese-mixture, but not a lot of it. Just a dabble. Let this sit for about 20 minutes to let the noodles absorb some liquid before they go into the oven. Preheat your oven to 375 and bake for 30 minutes, or until golden and bubbly. Personally, I think this is best served the next day; however, I have much higher standards than the average minion and don’t expect all of you to live up to my superior taste buds. Now go get your nom on! Yes. Yes I am. Ever since I lectured myself on the beauty and wonder that is a perfectly crafted lump of pasta-sauce-cheese, I just can’t get enough of the stuff. I found myself sneaking (who am I hiding from? my cat?) into the refrigerator late at night (grandma here considers “late” to be about, oh, 8:45pm) and snarfing spoonfuls. I had to hide it in the freezer. Whew! Dodged that bullet. But now the guns are blazing again, ready for round two. AND I’m going to finish it off with a lavender (there it is!) cheesecake with a lemon glaze. What’s the number for Jenny Craig…? Get it on my speed dial, STAT. I was feeling particularly crafty this morning. Probably something to do with the full moon, but my brain didn’t seem to want to settle on one simple ingredient to focus on today. It jumped from basil to pesto to lasagna to squash and then to kale. ???? Hey! why not? Sometimes you need to go a little cray-cray (that’s slang for “crazy pants,” in case you’re not hip and cool like me). So here is my helter-skelter, creamy pesto lasagna with kobocha squash and dinosaur kale (rawr!). olive oil (I don’t put an amount in because some people like their pesto more liquidy, some like it more hearty. 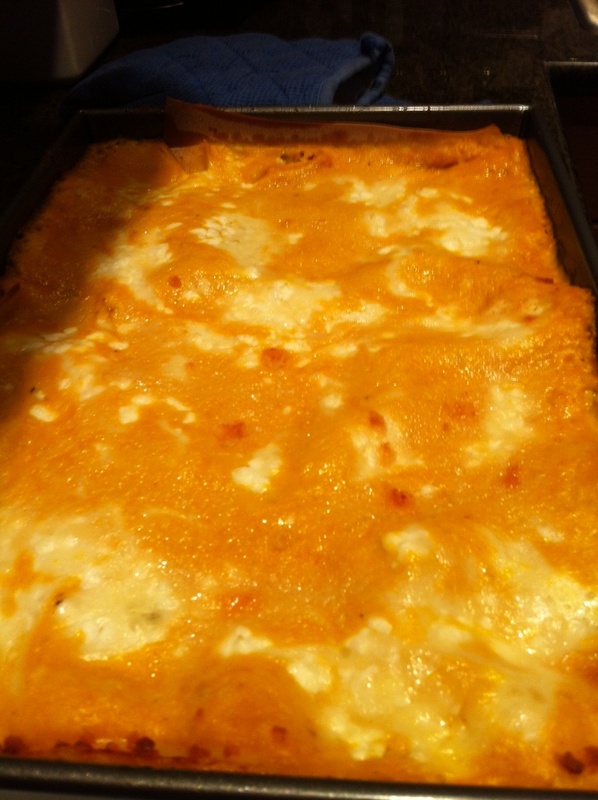 for this recipe I put in a minimal amount since I didn’t want oil pooling on the lasagna. Icky gross). Toss everything but the oil into a cuisinart, or if you’re old school, chop it all very fine and mix by hand. Don’t judge– I had to do that before I got my fancy machine. I had some nice hand muscles because of it (jealous?). Stream the olive oil while the motor is running until you get the desired consistency. Now grab a cracker or your favorite finger and try some out. Give yourself a high-five, transfer pesto to a bowl, and cover with plastic wrap. Grab another cracker. Now, I hope you’re ready to be annoyed by must infuriating vegetable I have yet to come across. I had to leave the room for a few minutes and meditate with some Prince in my earbuds before I could return to the scene of the crime. Just remember, party people: patience is a virtue. Find your chi and center the hell out of it before purchasing a Kabocha. I bought two of these little monster and cut them into thin slices. For the Kale, one bunch was sufficient for this lasagna. Just rip the greens off the “rib”, rinse, and chop into smaller pieces. Lovely! If you don’t feel like giving yourself a high five again for such excellent work, go ahead take a shot of vodka, eat a tub of ice cream, or whatever it is that makes you feel like a man. I didn’t add garlic this time because I think you’ll be able to ward enough a herd of vampires with the amount of G that’s in the pesto. But feel free to add it to the bechamel if you’re feeling inadequate. So melt the butter, add the flour, stir it around, add the milk a little at a time. Yes, this is the clifsnotes version. So sue me. Just keep whisking, just keep whisking. It won’t look like unappetizing curdled goat cheese for long, and it definitely won’t taste like it, either. So pretty. And you’re in the home stretch, ladies and germs. It’s hammer time. Repeat 3 more times. Because of the kale, my lasagna was about an inch higher than the pan. BUT since squash and kale reduce in size as they cook, worried was I not. Looks like a hot mess, right? Never fear, comrades. It was DELICIOUS! It’s nice to have spin on regular lasagna, and this one stole the show. It wasn’t greasy like most pesto lasagnas can be and the veggies were a good complement. Bravo. It might be interesting to mix up the type of pesto (perhaps using all spinach for a milder flavor, walnuts paired with butternut squash and a sage cream sauce…possibilities are endless!) I can see goat cheese being deeeeelightful in this. Nom nom! Oh sure. You could slap some beef ragu on some penne, maybe mix in a little cream if you’re feeling frisky, and then call it a day. But where’s the love? The comfort? The blood, sweat, tears?? If you want people to think you’re merely average then I implore you to follow through with the above method of entertaining. It’ll get you a solid 3 out of 5. But not this lady. I want people (and by people, sometimes I mean just me…sometimes it’s all just for me!) to know that I positively slaved over a complicated process that would make even Leonardo cross his eyes in wonderment. And why?